The operations of an emergency department, such as staffing or even its physical layout, can be complex. Poor operational decisions can lead to inefficiency, excessive wait-times and even substandard patient care. Roundtable Analytics takes advantage of deep analytics to equip emergency departments with better decision-making tools. Its Emergency Department Solutions Suite relies on RStudio, Shiny and Shiny Server Pro to enable a wide range of emergency department stakeholders to improve patient and business outcomes. An emergency department at any given moment is an almost infinite combination of patients, providers, procedures, and physical resources. Roundtable Analytics knew that computer simulation offered the key to identifying changes that would lead to better outcomes. “We wanted to enable those who understand emergency department operations, who are not typically programmers or simulation software experts, to take advantage of computer simulation when making decisions,” says Kenneth Lopiano, PhD, Roundtable Analytics’ Director of R&D. Roundtable Analytics chose RStudio, Shiny and Shiny Server Pro to build and power the computer simulation program developed entirely in R.
Users can simulate their own emergency department under a variety of settings that include changes to physician and nurse staffing throughout the day, how many beds are in different units of the department, even changes to how long labs take to be returned to the physician who ordered them. 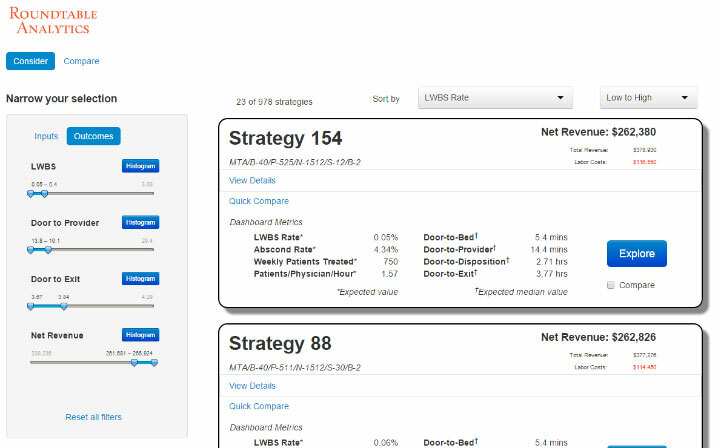 Emergency Department Solutions Suite automatically simulates potentially thousands of strategies and makes it easy to pick out the ones that lead to patients being seen quickly and efficiently. Roundtable Analytics sees its solution improving emergency medicine across the country by taking advantage of data that are already routinely collected. By making deep analytics accessible to decision-makers, the Emergency Department Solutions Suite promotes evidence-based decisions to drive healthcare efficiency up, waste down and, most importantly, yielding healthier and more satisfied patients.